Definition at line 39 of file tdi.h. Definition at line 43 of file tdi.h. Definition at line 42 of file tdi.h. Referenced by TdiBuildNullConnectionInfoInPlace(), and TestTcpConnect(). Definition at line 45 of file tdi.h. Referenced by AfdPacketSocketWriteData(), AfdSendTo(), DGDeliverData(), DGReceiveDatagram(), ICMPSendDatagram(), ListenComplete(), RawIPSendDatagram(), SatisfyAccept(), SatisfyPreAccept(), TCPCheckPeerForAccept(), TCPConnect(), TdiBuildConnectionInfoInPlace(), TdiBuildNullConnectionInfo(), TdiBuildNullConnectionInfoInPlace(), TdiReceiveDatagram(), TdiSendDatagram(), TestTcpConnect(), UDPSendDatagram(), and WSPSendTo(). Definition at line 44 of file tdi.h. 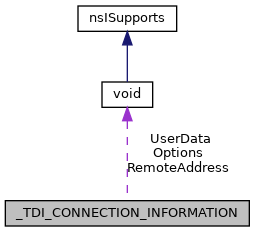 Referenced by AfdSendTo(), DGReceiveDatagram(), TdiBuildConnectionInfoInPlace(), TdiBuildNullConnectionInfo(), TdiBuildNullConnectionInfoInPlace(), TdiReceiveDatagram(), TdiSendDatagram(), TestTcpConnect(), and WSPSendTo(). Definition at line 41 of file tdi.h. Definition at line 40 of file tdi.h.